This chapter focuses on the Arguments section (officially known as the Logical Reasoning section) with cases designed to familiarize you with a four-step method you can use to answer every question. There are 11 cases in all. The first 10 introduce you to the 10 types of questions that appear in the Arguments section. The final case discusses how you should approach the section as a whole. 3. Analyzing the reasoning of the argument. This skill shifts you away from focusing on the substantive content of the argument and toward understanding its argumentative strategy, method, pattern, and structure. Variations in how you are asked to apply those skills produce a total of 10 different question types. 1. Read the question and identify your task. 2. Read the argument with your task in mind. 3. Know what you’re looking for. 4. Read every word of every answer choice. Two final notes: First, the Arguments section requires you to take a comparative approach to the answer choices. In the Logic Games section, there was one answer choice that was objectively, demonstrably right, and four choices that were objectively, demonstrably wrong. You won’t have the same luxury of certainty in the Arguments section. Here it’s all relative. Sometimes the right answer will jump off the page. Other times you’ll read all five choices and think that none can be the correct answer. Identifying the correct answer to an Arguments question is a comparative process. Second, the same advice that the introduction to the Logic Games chapter concluded with—practice, practice, practice—is equally applicable here. The best way to improve your performance on the Arguments section is to work a large number of practice questions; the practice tests in the back of this book are a good place to start. The cases in this chapter are designed to equip you with a set of conceptual categories you can use to describe and understand the ideas you’ll be working with in the Arguments section. Those conceptual categories will become more useful as you fill them in with examples that define the contours of their meaning. To do that, you have to apply them repeatedly. In the absence of practice, they’ll be little more than empty labels. Working practice questions will help you develop a capacity for judgment that will serve you well on test day. This case will teach you how to approach Arguments questions in which your task is to identify the argument’s conclusion. Conclusion questions make up just 6 percent of the test on average. That means you’re only likely to see about three of these questions on your two Arguments sections. Even so, mastering Conclusion questions is a critical component of your Arguments-section strategy. Why? For one, these questions tend to be some of the easiest in the Arguments sections. With a sound approach, you should be able to answer almost all of them correctly. More important, your approach to almost every other question on the Arguments section will begin with your identifying the premises and conclusion of the argument. The tools and techniques you’ll learn in this case are the fundamental building blocks of a successful approach to the entire Arguments section. An argument is an attempt to convince the reader of the correctness of an opinion by presenting facts and evidence in support of that opinion. Every argument is made up of two basic types of statements: premises and a conclusion. In this argument, the first two statements are the premises, and the last statement is the conclusion. This is not to say that every single statement you encounter on the Arguments section will be either a premise or a conclusion. Some arguments will include general background information to help you better understand the content of the argument. But the work of every argument is done by its premises and conclusion. The single most valuable piece of advice you can get about the Arguments section is this: always read the question before you read the argument. Each question asks you to perform a specific task. Fortunately, the LSAT uses stock, predictable language to identify the task you need to perform, which each case will teach you to recognize. the main conclusion drawn in the argument above? the conclusion of the argument as a whole? the main point of the office manager’s reasoning? The nature of your task will have a dramatic impact on how you read the argument. Sometimes you will focus exclusively on the material in the argument. Other times you will be looking for a point in the argument where you can supply a piece of missing information. The wording of the question will help to identify the task you need to perform; you’ll read each passage with a clear focus on what’s most important. You should be an engaged reader, circling key terms and jotting notes that identify the different parts of the argument. Conclusion questions ask you to find something that’s already on the page. The argument has a conclusion; your job is to locate it. There are two primary tools you can use to help you distinguish between what you’re looking for (the conclusion) and the rest of what makes up the argument (premises and background information). First, you’re looking for an opinion. The conclusion is likely to be phrased so that it expresses some kind of point of view, solution, proposal, explanation, or prediction. By contrast, the premises (as well as any background statements) are statements of fact, objective expressions of information and details about the situation. Premises are facts. Conclusions are opinions. After you’ve read the argument, you will know what the correct answer should look like and what function it needs to serve, even if you won’t know exactly what the phrasing will be. Being aware of what you’re looking for before you begin reading the answer choices will help you sort through them more quickly and more accurately. Once you’ve read the argument, determine which of the sentences states the conclusion of the argument. Remember to be an active reader: once you’ve made your selection, indicate in writing that you believe this to be the conclusion. Put brackets around it, put an asterisk next to it in the margin, do something. Marking up the argument will help ensure (1) that you know what answer you’re looking for when you turn to the answer choices; and (2) that you don’t lose your train of thought while you’re working through the choices. 1. Read the section of the argument that you believe presents the background information and premises. 2. As the last sentence, insert “Therefore,” then follow it with the sentence that you think is the conclusion. The mayoral election is approaching. I plan to vote for the incumbent mayor, since her record on fighting crime is strong and nothing is more important to our city than public safety. The mayoral election is approaching. The incumbent mayor’s record on fighting crime is strong. Nothing is more important to our city than public safety. Therefore, I plan to vote for the incumbent mayor. The reason this technique works is that arguments are easiest to follow when the premises are presented before the conclusion. One of the ways the LSAT writers make Conclusion questions more difficult is by burying the conclusion in the middle of several premises. 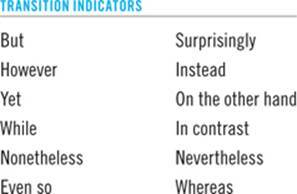 Another way is to include no premise indicators or conclusion indicators. This technique addresses both of those sources of difficulty. There is a substantial reading comprehension component to the Arguments section. The difference between a right or wrong answer can turn on the presence or absence of a single word. Because you’re working under time constraints, it can be tempting to begin reading a choice, assume you know where it’s going, and not read all the way through to the end. This is a costly mistake. Read every word of every answer choice every time. The right answer to a Conclusion question will be the choice that most closely matches the argument’s conclusion. The test writers will use paraphrasing and synonyms to make the correct answer more difficult to spot. They’ll also sometimes change the sentence structure, so that if there are two clauses in the conclusion sentence, the correct answer will reverse their order. 1. Introduces new information. This is the easiest type of wrong answer choice to identify. If you read a statement in the answer choice that you didn’t see in the argument, it can’t be the correct answer to a question that asks you to indentify the conclusion. The right answer must be somewhere in the argument. 2. Restates a premise. By far the most common type of incorrect answer to a Conclusion question is a restatement of one of the premises or a piece of background information from the argument. The test writers also know you are more likely to select an answer choice if it contains a statement you’ve already seen. 3. Inaccurately summarizes the conclusion. You’ll also frequently see answer choices that reference the argument’s conclusion but do not accurately restate it. Such choices might add information to the conclusion, change the scope of the conclusion (make it too broad or too narrow), or change the effect of the conclusion by using language that is too powerful (words such as “always” or “never”) or too weak. Office Manager: The new building that our firm is moving into has enough square footage that we could install additional conference rooms. With the extra conference rooms, the new building would have exactly enough offices and cubicles for the firm’s current staff. Therefore, in light of the fact that our firm is growing so quickly that we expect to double our staff within the next 18 months, we will probably use the extra square footage for additional offices and cubicles. Which one of the following most accurately expresses the conclusion of the office manager’s argument? (A) The firm is growing so quickly that it expects the size of its staff will double within the next 18 months. (B) Most of the firm’s new staff will require offices instead of cubicles. (C) The new building the firm is moving into has enough square footage that the firm could install conference rooms. (D The extra square footage in the new building is more likely to be used for offices and cubicles than for conference rooms. (E) With conference rooms, the new building would have enough office and cubicle space for all of the firm’s current employees. Answer and Analysis. The correct answer is choice D. Note that this answer choice is the only statement of opinion in the argument. You also have a conclusion indicator, “Therefore,” pointing you to this statement, although this argument illustrates a common way in which Conclusion questions will try to throw you off track. The conclusion is separated from its indicator word by another premise, which makes it harder to identify. Choice C restates the first sentence, which is background information. Choices A and E restate the argument’s premises. And choice B introduces new information that appears nowhere in the argument. The new office space that our firm is moving into has enough square footage that we could install conference rooms alongside the offices and cubicles. With conference rooms, the new office space would have exactly enough offices and cubicles for the firm’s current staff. But our firm is growing so quickly that we expect to double the size of our staff within the next 18 months. Therefore, ________. This is just a slightly more difficult version of a Conclusion question. You’re asked to pick an answer choice that most accurately states the argument’s conclusion. (Another way of phrasing this that you might come across is “Which one of the following most reasonably completes the last sentence of the passage?”) So instead of identifying the conclusion, you’re supplying it. These questions aren’t particularly common (they average less than one per LSAT), but they show up often enough to merit a brief discussion. You should approach these Logically Completes the Argument questions using techniques similar to the ones you use to answer standard Conclusion questions. Everything you see is either background information or a premise. The argument will build toward a conclusion but stop short of stating it. Before you turn to the answer choices, jot down on the page what you think the conclusion will be. The correct answer will express an opinion that is the result of combining one or more of the ideas or facts presented in the argument’s premises. Typically this opinion will repeat specific words and phrases that appeared in the premises. By contrast, many incorrect answers to this type of question will present an opinion that combines the information from the premises with a new fact or consideration not previously discussed. The other most common type of wrong answer is a simple restatement of one of the premises. This case focuses on questions that ask you to make a deduction based on the content of the argument. Deduction questions are historically the third most common type of Arguments question, making up 12 percent of the questions (an average of about six per test). Like Conclusion questions, Deduction questions focus your attention on what’s already on the page. But where Conclusion questions ask you to identify a single statement in the argument, Deduction questions ask you to combine. Deduction questions instruct you to assume that every statement in the argument is true. The correct answer takes two statements from the argument and combines them to produce a new statement that, based on the facts contained in the argument, you can be sure is also true. Before turning to the details of how to apply the four-step method to Deduction questions, this case begins with a discussion of the two most common ways that Deduction questions combine statements. Frequently the argument associated with a Deduction question will contain several statements describing the argument’s subject matter in terms of quantity, frequency, or probability, and the correct answer will be a deduction that results from the combination of two of those statements. Deduction questions repeatedly use a handful of descriptive terms to make those descriptions. These terms carry very precise meanings. It’s important to understand exactly what those meanings are so you won’t mistakenly assume that an argument has told you any more than it actually has. Yes, you read that correctly: on Deduction questions, the only difference between many and some is that if there are many things, you can safely assume there is more than one. The word some could imply just one thing. Otherwise the two terms are interchangeable. Deduction questions also require you to revisit a topic covered in Case 2 of the Logic Games chapter: conditional statements. Many Deduction questions present information in the form of conditional statements. To identify the correct answer to these questions, you have to know how such statements can and cannot be combined. Three aspects of conditional statements are particularly important to Deduction questions: (1) making the deduction that is the contrapositive; (2) figuring out what you know and what you don’t know; and (3) translating nonstandard conditional statements. Understanding contraposition is essential to success on Deduction questions. A recurring pattern in Deduction questions is the presentation of an argument that contains two statements in the following form: “If A, then B” and “Not B.” The correct answer to such a question—by operation of the statement’s contrapositive—is almost always in the form “Not A.” This is the most common type of conditional statement–based deduction that you’ll make on Deduction questions. Second, when you have a conditional statement, it’s important to keep track of what you know and what you don’t. Remember: follow the arrow. Always start on the left side of the statement. For example, suppose one statement in the argument tells you “A → B.” The contrapositive means you automatically also know “~B → ~A.” How might that statement interact with a later statement in the argument? Third, unlike the Logic Games section, where conditional statements typically took the standard “if, then” form, the Arguments section frequently uses conditional statements in nonstandard form. You would do well to memorize this chart. On test day, you are virtually certain to encounter a Deduction question that requires you to translate and manipulate a nonstandard conditional statement. In particular, “Unless,” “All,” None,” and “Only if” statements are Deduction-question hallmarks. Deduction questions always tell you to assume that everything in the argument is true and ask you, based on that assumption, what else you know to be true. Within that general framework, however, there are two subtypes of Deduction questions. Which one of the following follows logically from the statements above? Which one of the following can be properly inferred from the information above? Which one of the following is most strongly supported by the statements above? There is a very important difference between Deduction questions and Conclusion questions. The “arguments” associated with Deduction questions typically do not contain a set of premises and a conclusion. Rather, they are simply collections of factual statements. Consequently, as you read the argument you don’t have to worry about identifying its constitutive parts. Rather, your focus should be on identifying and understanding each factual statement the argument contains. You’re looking for facts: concrete, specific statements that are squarely supported by the content of the argument. When the question is worded such that you’re looking for an answer choice that is conclusively established, you need something that is absolutely, positively, 100 percent guaranteed to be true based on the argument. When you’re looking for the answer choice that is most strongly supported by the argument, the correct answer doesn’t have to be logically compelled by the argument, but it should require only the tiniest of inferential leaps from the information in the argument to the statement in the answer choice. If you see that the argument uses conditional statements, you should quickly symbolize those statements (and their contrapositives) in the margin of your test booklet. When an argument contains multiple conditional statements, the correct answer is almost always a combination of those statements. Symbolizing them will enable you to combine them quickly and accurately. Identifying the right answer to a Deduction question is like trying to pick out a faint radio signal against a wall of background noise. The right answer never involves every statement contained in the argument. Indeed, the primary way the test writers make Deduction questions more difficult is by providing you with information that you don’t need. If the argument only contained two statements, it wouldn’t be hard to find the answer choice that combined them. But when the argument contains six statements, finding an answer choice that appropriately combines two of them is much more difficult. The right answer will be a factual statement that, depending on the wording of the question, either is guaranteed to be true or is very, very likely to be true based on the content of the argument. 1. Deductions not supported by conditional statements. Errors in contraposition, deductions that go against the arrow, and mistakes in translating “unless” and “only if” conditionals are common wrong answers on Deduction questions whose arguments include conditional statements. 2. Answers that discuss new or outside information. Deduction questions ask you what must be true based on the content of the argument. Not surprisingly, then, answers that discuss topics and information that are not discussed in the argument cannot be correct. That might sound straightforward, but there are two ways the test writers will try to tempt you to select one of these choices. The first way is by playing on your outside knowledge of related topics. For example, if the argument gave you information about the calorie content of a hamburger, wrong answer choices might discuss the levels of vitamins, fiber, salt, or protein in a hamburger. The second way is by using the word only. That one word quietly makes a comparison between what’s listed in the answer choice and everything else in the entire world; only is a giant red flag in an answer choice to a Deduction question. 3. Implying an inference based on context. If someone told you, “My friend Calvin is tall. My friend Gus is tall and thin,” you might reasonably infer that Calvin is not thin. But on a Deduction question, that kind of inference is impermissible. You can’t assume that a fact is true based on only context. Deduction questions are about explicit information; you need to be able to point to the portion of the argument that expressly tells you the fact you’re relying on. 4. Mismatched quantity, probability, or frequency. Be on the lookout for subtle shifts and slip-ups in the use of these terms. An argument that tells you that something “may” be true won’t support an answer choice that says something “must” be true. If “some” things have a quality, you don’t know that “all,” “most,” or even “many” of them have that quality, too. 5. Answers involving normative language. Like the word only, normative words of quality and judgment—should, ought to, bad, good, better, worse, etc.—are red flags in Deduction question answer choices. Unless the argument contains these same kinds of judgment-passing words—and the arguments associated with Deduction questions rarely do—they disqualify any answer choice in which they appear. A set of descriptive, factual statements cannot guarantee the truth of a normative, value-laden conclusion. The world is home to more than a dozen species of wolves. Some of them are not threatened by habitat destruction, but the Great Plains wolf is. The enactment of a federal habitat-restoration program would increase the number of Great Plains wolves in the wild without causing overpopulation. If the Great Plains wolf population increased in size without becoming overpopulated, the wolves would hunt Northern pocket gophers, which would benefit many farming communities throughout the Midwest. If the above statements are true, which one of the following must be also be true? (A) At least some Midwest farming communities would benefit if a federal habitat-restoration program were enacted. (B) If a federal habitat-restoration program is not enacted, the size of the Great Plains wolf population will not increase in size. You can’t draw that conclusion based on either of the conditional statements contained in the argument; it’s an erroneous attempt to state the contrapositive of the third sentence. Electronics manufacturer: Developing a line of smartphones would require a research-and-development push that would directly trade off with our R&D efforts on five other products. Plus, a line of MP3 players—another product we have discussed developing—has an inherently higher profit potential than a line of smartphones and would be cheaper to manufacture. (A) Developing a line of MP3 players would not trade off with the R&D efforts on any other products. Answer and Analysis. The correct answer here, choice B, illustrates the difference between a “conclusively establish” Deduction question and a “strongly support” Deduction question. The argument does not come right out and say that a line of MP3 players would be “more likely to make money” than a line of smartphones. But the argument does say that a line of MP3 players “has an inherently higher profit potential.” It takes an inference to go from the latter to the former, but that inference is not a very big one, and it’s even easier to make in light of the fact that MP3 players are cheaper to manufacture. Meanwhile, choice A makes an implied inference; the argument is silent on the question of whether developing MP3 players would entail any R&D trade-offs. You might reasonably assume that it would not—why criticize smartphones on that ground if MP3 players are not immune from the same criticism?—but the argument never comes right out and says so. A reasonable assumption is not a deduction. Choice C introduces normative language—a “bad” business decision—not taken from the argument. Choice D is a mismatch of probability: although the MP3 has a higher profit potential, it is not guaranteed to be profitable. And choice E has the watchword only, which implicitly discusses a wealth of outside information. Nothing in the argument states that the electronics manufacturer could not profitably develop, for example, earphones, car stereos, or tablet computers. This case discusses Arguments questions that ask you to apply a general principle to a specific situation. Over the past five years, Principle questions have been one of the least common types of Arguments question, making up a little more than 7 percent of the questions (an average of just three per test). Still, it is one you should be familiar with. This is the third question type that focuses your attention exclusively on the content of the argument. Conclusion questions ask you to identify a particular statement in the argument. Deduction questions ask you to combine two statements in the argument. And Principle questions ask you to pick an answer choice that accurately describes the content of the argument in more general terms. Which one of the following principles is best illustrated by the argument above? The reasoning above most closely conforms to which one of the following principles? Which one of the following most accurately expresses the principle underlying the argument above? Sometimes the question will use the term proposition or generalization in place of principle. Since your ultimate task is to identify a principle that accurately restates the argument in more general terms, your first step is to understand the specific terms of the argument. Sometimes the argument associated with a Principle question will be a true argument, offering one or more premises in support of a conclusion. When you see an argument like this, use the techniques you learned in Case 1 to identify the argument’s parts. Other times the argument will simply be a collection of factual statements. In that case, you should draw on the techniques you learned in Case 2. Identify each separate factual claim the argument makes. Check to see if the argument establishes any kind of relationship between those factual claims or makes any comparison or connection between them. The right answer to a Principle question will preserve the logical relationship between the various statements in the argument while summarizing or recasting the argument at a higher level of generality. How much more general will the principle be? It depends. Some principles sweep very broadly. Others are so specific that they can feel like the right answer to a Deduction question. But the level of generality at which the principle is stated will not affect how you tackle the question: you’ll break the principle down into parts and work with the parts one at time. Finding the right answer to a Principle question is a step-by-step process of parsing and matching. Each answer choice will list a different principle. Parsing requires you to break each of those principles down into its component parts so that you can work with the parts one at a time. The principle usually has two parts: (1) a statement of a rule to guide behavior or decisions; (2) a caveat that limits the contexts or circumstances in which the rule applies. You’ll work with each part individually, looking to see whether there is a portion of the argument that corresponds to that part of the principle. You’ll repeat this process with each part of each principle in each answer choice. Common Types of Wrong Answer Choices. There’s only one kind of wrong answer to a Principle question: an answer choice that contains one or more component parts that do not correspond to any portion of the argument. Most wrong answers will conform to some parts of the argument but not all of them. Horticulturalist: Amateur gardeners often spray their gardens with a particular type of pesticide known as fungicides in an attempt to rid their gardens of stinging nettle. They should not do so. Stinging nettle is a flowering herb. Fungicides do not stunt the growth of flowering herbs. Spraying a fungicide on stinging nettle thus will not stunt its growth. Plus, fungicides have the potential to severely damage the topsoil in most gardens. Which one of the following most accurately expresses the principle underlying the horticulturalist’s reasoning? (A) An amateur gardener should not use a pesticide to rid a garden of a particular weed if the pesticide will not stunt the growth of that weed and may have other harmful effects on the garden. (B) An amateur gardener should use every pesticide that is likely to stunt the growth of any weed. (C) An amateur gardener should not use a pesticide if the pesticide will stunt the growth of a weed without killing it. (D) An amateur gardener should not use a pesticide to rid a garden of a particular weed if it is unclear whether the pesticide will stunt the growth of that weed. (E) An amateur gardener should not use a pesticide that might have negative consequences for the garden, even if that pesticide would stunt the growth of some weeds. Answer and Analysis. This argument offers a conclusion—amateur gardeners should not attempt to rid their gardens of stinging nettle by spraying their gardens with fungicides—and two premises in support of that conclusion: (1) fungicide does not stunt the growth of stinging nettles; (2) fungicides have the potential to severely damage most gardens’ topsoil. You’re looking for an answer that tracks the content of the argument and reinforces the logical relationships between the various statements. To assess the principles in the answer choices, break each one of them down into parts and look for a part of the argument that corresponds to each part of the principle. Start with choice A. Its conclusion is “An amateur gardener should not use a pesticide to rid a garden of a particular weed.” That part of the principle is consistent with the argument: “a pesticide” is a more general description of “fungicides,” and “a weed” is a more general description of “stinging nettle.” Next, the principle conditions its conclusion on the presence of two facts. The first fact is that “the pesticide will not stunt the growth of that weed”; that part of the principle tracks premise (1) of the argument. The second fact, that the pesticide “may have other harmful effects on the garden,” tracks premise (2), which states severe topsoil damage is a harmful effect. Therefore, choice A is the correct answer to this question. All three parts of the principle it states correspond to different parts of the argument. Compare choice B. Its conclusion—“An amateur gardener should use every pesticide”—does not match the conclusion of the argument. And the second part of choice B also does not match any part of the argument. The argument tells you nothing about pesticides that are effective in stunting weed growth. The conclusion of choice C matches the conclusion of the argument, but the second part of its principle has the same problem that choice B had: it discusses pesticides that do stunt weed growth. It also introduces a new consideration—killing weeds instead of merely stunting their growth—that has no counterpart in the argument. The conclusion of choice D matches that of the argument, but the second part of its principle does not. The argument says fungicide should not be used because it absolutely will not stunt the growth of stinging nettle, while the corresponding part of this principle would prohibit pesticide use even when a pesticide’s effectiveness is only uncertain. In choice E, two of its three parts correspond to the argument. But its statement that the rule against using a pesticide should be followed “even if that pesticide would stunt the growth of some weeds” has no counterpart in the argument. As this example illustrates, working a Principle question can be a meticulous process. Breaking the choices down into smaller, more manageable parts is the best way to identify subtle differences between wrong answers and the argument. Which one of the following is consistent with the principle expressed by the argument? Which one of the following most closely conforms to the principle stated above? This variation is not a substantive one. You’ll still parse the principle by breaking it down into parts, and you’ll attempt to match each of those parts to a part of each of the factual scenarios or “arguments” contained in the answer choices. Instead of working with multiple general principles, you’re working with multiple factual scenarios. Both your task—finding an answer choice that accurately restates the argument at a different level of generality—and the process by which you perform that task will remain the same. This case focuses on Arguments questions that ask you to identify an assumption of the argument. Over the past several years, Assumption questions have been the single most common question type. About 16 percent—that’s eight questions across the two sections—are likely to be Assumption questions. Unlike question types discussed in the first three cases, which focused on material that was part of the argument, Assumption questions focus on what’s missing—what’s not on the page but should be. Your task is to provide the missing link that bridges the gap between the argument’s premises and its conclusion. This case will teach you how to do so by focusing on differences between the wording of the premises and the wording of the conclusion. Background: What Is an Assumption? Anyone who is an American is not a Canadian. Therefore, Tanya is not a Canadian. This simple argument proceeds on the assumption that Tanya is an American. The argument relies on assuming which one of the following? The conclusion follows logically from the premises if which one of the following is assumed? Which one of the following, if assumed, enables the conclusion of the argument to be properly drawn? Unlike a Conclusion question, where the answer is already written on the page, an Assumption question asks you to find something that should be there but isn’t. That affects how you should read the argument. Instead of looking for the answer, you’ll be looking for the place in the argument where the answer fits in. Assumption questions require you to identify differences between the wording of the premises and the wording of the conclusion. 1. Identify the argument’s conclusion and premises. Use the tools and techniques you learned in Case 1 to perform this step (keeping in mind that some statements may just be background information). 2. Identify new language in the conclusion. Look carefully for terms, words, or phrases in the conclusion that you don’t see anywhere else in the argument. Draw circles around any new language that shows up for the first time in the conclusion. 3. Identify the gap between the premises and the conclusion. Look for language that appears in the premises but does not appear in the conclusion. The conclusion substitutes the new language you found in step 2 for the language you’re finding here at step 3. Consumer psychologist: Car manufacturers will soon begin to include side airbags as a standard feature on most cars they manufacture. This makes sense, for these manufacturers want to maximize the number of cars they sell, and most parents will not purchase a new car unless it is safe and will reduce the risk of injury in case of an accident. The first sentence of this argument is its conclusion. It is supported by two premises in the next sentence, which are introduced using the “For … and … ” premise indicator. In the conclusion, we see that car manufacturers “will soon begin to include side airbags as a standard feature.” That’s the first time in the argument that we see language about airbags. Identifying a language gap is a mechanical process that you can apply to even the most difficult Assumption questions. Once you’ve identified the conclusion, circle the words you don’t see anywhere else in the argument. Then review the premises one by one and look for words used in the premises that have dropped out of the conclusion. With practice, you’ll be able to pick out these shifts in wording even in arguments that you have a hard time understanding. Before you turn to the answer choices, articulate to yourself the words or phrases you want to connect. With the practice question argument you might say, “I’m looking for an answer that connects the inclusion of side airbags as a standard feature with safety and the ability to prevent injuries in an accident.” Don’t worry about the specifics of how those phrases will be connected. There’s no way you can anticipate the exact phrasing that the correct answer will use. The correct answer to an Assumption question will bridge the gap between the premises and the conclusions, not just linguistically but logically. Once you’ve identified what you think is the correct answer choice, double-check yourself by using the “plug it in as a premise” technique. Reread the argument (premises first, then conclusion, the same way you reread it on Conclusion questions), but plug in your answer choice as the final premise right before the conclusion. This new premise should contain the new language from the conclusion that’s missing from the rest of the argument and also cause the argument to make better sense. 1. Introduces irrelevant new information. This is the most common type of wrong answer choice to an Assumption question. These answer choices will discuss a fact or idea that is superficially related to but logically distinct from the topic of the argument. These choices tend to be worded very generally and offer very little concrete information. 2. Makes an irrelevant comparison. This is a subcategory of choices that introduce irrelevant new information. An answer choice that makes an irrelevant comparison might state that the topic of the argument has some quality or characteristic in common with a different topic. Or, it might make some kind of comparative claim about the topic of the argument that is the “best” or “only” of a particular category. These choices go astray because they broaden the argument’s scope instead of strengthening the connection between its premises and its conclusion. 3. Bolsters or provides more detail about a premise. These choices can be intuitively appealing because they can make the argument seem more credible. But knowing more about the premises doesn’t help bridge the gap between those premises and the conclusion. 4. Weakens the argument. This is another frequent type of wrong answer. It can be appealing because many of the arguments in the Arguments section are questionable or even wrong, and these choices point out something that the argument overlooks. But remember, your job is always to find the assumption that makes the argument work. (A) Parents are also concerned with safety and reducing the risk of injury in case of an accident when they purchase a used car. (B) Safety is more important to parents who are purchasing new cars than aesthetics and price. (C) Cars that include side airbags as a standard feature are safe and will prevent many injuries in case of an accident. (D) Car manufacturers study their customers’ preferences and buying habits in great detail. (E) People who are not parents purchase new cars on a far more frequent basis than parents do. Answer and Analysis. Only choice C attempts to bridge the gap between airbags and safety. And it does so in a way that makes sense in the context of the argument. The argument is concerned only with parents who are purchasing new cars. Choice A gives you irrelevant new information about the parents who are purchasing used cars, which does not bridge the gap between airbags and safety. Choice B compares the importance of safety to the importance of aesthetics and price. A choice like this one goes outside the scope of the argument to introduce new, tangential considerations. Choice D simply provides more detail about a premise. And choice E weakens the argument, which is the opposite of what you’re being asked to do. This choice actually demonstrates why the argument should be rejected. Consumer psychologist: Car manufacturers want to maximize the number of cars they sell, and most parents will not purchase a new car unless it is safe and will reduce the risk of injury in case of an accident. Cars that include side airbags as a standard feature are safe and will prevent many injuries in case of an accident. Therefore, car manufacturers have begun to include side airbags as a standard feature on most cars they manufacture. Read like that, this argument is airtight, so you can be confident that choice C is the correct response. This case addresses questions that ask you to select the answer choice that strengthens the argument’s conclusion. You’re likely to encounter about five Strengthen questions on test day. Strengthen questions follow a consistent pattern. The argument’s premises present a set of facts, usually based on some kind of research, study, or survey. The argument draws a conclusion based on the data presented in the premises. That conclusion might be a prediction, an explanation of past events, or a claim about causation. The correct answer provides additional, concrete information that lends further support to the argument’s conclusion. The test writers repeatedly utilize the same small handful of argumentative strategies to generate right answers to Strengthen questions. This case will teach you what those strategies are. provides (or “lends” or “adds”) the most support for the speaker’s position? would most strengthen the reasoning above? most helps to support [a particular claim] made in the argument? Your priority here is the same as it was on Conclusion and Assumption questions: identify the conclusion and the premises offered in support of it. Use indicator words to guide you. The premises of the argument will introduce some kind of data: the results of historical research, a scientific study, or simple observation. The conclusion will then state an opinion about or based on that data. Stockbroker: My firm classifies all of its brokers as either risk-averse or risk-tolerant. We recently undertook a comprehensive study of our brokers’ investment philosophies and found that over the past year the portfolios managed by risk-tolerant brokers were performing 16 percent better than those managed by risk-averse brokers. It is thus clear that success in investing in the stock market is a consequence of risk tolerance. 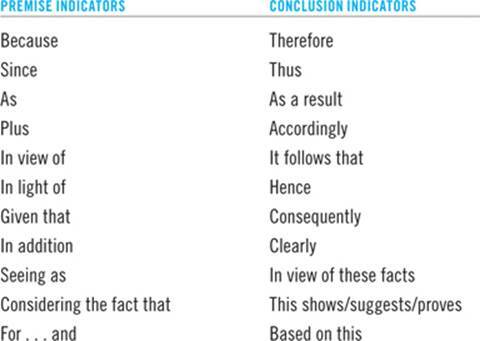 The argument’s conclusion appears in the last sentence, introduced by the conclusion indicator thus. The first sentence provides background on the study. The second sentence offers direct evidentiary support for the conclusion. Being aware of what type of conclusion the argument has drawn will make it easier to identify the correct answer. In this example, the conclusion is a claim about causation. The stockbroker claims that risk tolerance is the cause of successful investing in the stock market. 1. Provide data or evidence that is consistent with the conclusion. This is the most common type of right answer to a Strengthen question. Where the argument’s conclusion is some kind of theory, the right answer provides new information that makes the theory look more credible. 2. Rule out an alternative causation or explanation. 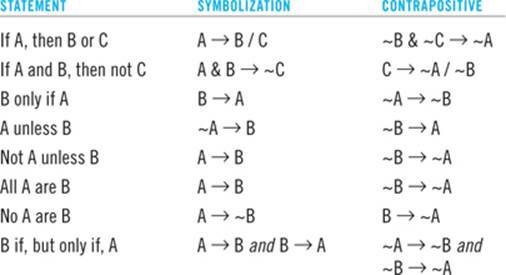 If the argument concludes that A causes B, the correct answer might rule out C causing B. If the conclusion is an explanation or a prediction, the right answer might rule out alternative predictions or explanations. 3. Bolster the reliability of the data. Strengthen arguments base their conclusions on the results of a study, a survey, or some other kind of research. The correct answer to some questions will firm up the study’s credibility. 4. Rule out reverse causation. While the first three types of right answers could show up regardless of whether the argument’s conclusion makes a claim about causation, explanation, or prediction, this last category is specific to causation questions (which are the most common subtype of Strengthen questions). If the conclusion claims A causes B, the correct answer might rule out B causing A. 1. Weakens the argument. These choices can be tempting for the same reason they’re tempting on Assumption questions: if you find the argument’s conclusion to be questionable or problematic, these choices can play to your instincts, even though they do the opposite of what the question asks. There’s at least one wrong answer that weakens the argument on virtually every Strengthen question. Circling the words in the question that identify your task can help prevent you from selecting these choices. 2. Provides additional, irrelevant data about the evidence. Strengthen questions are normative: you’re looking for a choice that makes the conclusion better, more persuasive. A purely descriptive choice doesn’t perform that task. 3. Makes a general statement about the topic of the argument. Correct answers to Strengthen questions are usually concrete and precise. Generalizations that paint in broad strokes can be tempting because they’re uncontroversial; they don’t seem wrong when you read them. 4. Offers support for a different conclusion. These choices can make the argument seem stronger in some undefined way. This is why it’s important to have a precise understanding of what the argument concludes: you’re looking for a choice that shares the same narrow focus. (A) The performance of the brokers’ investment portfolios over the past year has not been representative of how those portfolios typically perform. (B) The firm’s study utilized a combination of self-reporting and empirical data analysis to classify its brokers as risk-tolerant or risk-averse. (C) Some stockbrokers will not be able to earn a profit no matter what their level of risk tolerance is. (D) Risk-tolerant stockbrokers also exhibit more of the traits associated with being a good manager than do risk-averse stockbrokers. (E) All the stockbrokers in the study received an equal amount of training and were supervised by the same management team. Answer and Analysis. Choice E is the correct answer, as it eliminates an alternative causation or explanation. Choice A weakens the argument. It undermines the conclusion that risk-tolerant brokers are more successful. Choice B is a purely descriptive choice; it does nothing more than give you additional, descriptive details about something you already know. Choice C is a general statement. It lacks any hard facts that specifically connect it to the claim made by the argument’s conclusion. And finally, you might think of choice D as strengthening the argument in an irrelevant way. Knowing that risk-tolerant brokers also make good managers doesn’t tell you anything about profitable investing, and profitable investing is the only thing the conclusion concerns itself with. There is an additional type of Strengthen question that you might come across in the Arguments section. These questions ask you to select a principle that strengthens the line of reasoning contained in the argument. A question like this is different from a typical Strengthen question. These questions require you to combine the tools and techniques you’ve learned in this case with the ones you learned in Case 3’s discussion of Principle questions. Which one of the following principles, if valid, most helps to justify the reasoning of the argument above? Which one of the following principles most helps to justify drawing the conclusion in the argument? Which one of the following principles, if valid, provides the most support for the argument above? Which one of the following, if true, most justifies the above application of the principle? Step 2: Read the argument with your task in mind. A standard Strengthen question is like a snapshot from a science class. The argument gives you empirical data (the facts, evidence, or study results in the premises) and a theory (an explanation, prediction, or claim about causation) that is based on that data. The right answer, in some form or fashion, reinforces the connection between the data and the theory. By contrast, a Strengthen with a General Principle question is more like a snapshot from a philosophy class. The conclusion of the argument associated with these questions will be a normative statement: a claim that someone should or should not do something; an assessment that a proposed course of action should or should not be taken; or an evaluation that endorses or criticizes a proposal, practice, or idea. The premises will explain the factual background and context in which the conclusion applies. The right answer will be a general principle that justifies the conclusion’s normative stance. As you’re reading the argument, your focus should remain on identifying the conclusion and any premises offered in support of it. In addition to using the standard indicators to help you identify the conclusion, the conclusion to a Strengthen with a General Principle question will feature some kind of normative language: should, should not, appropriate, unethical, responsible for, and so on. Step 3: Know what you’re looking for. The right answer to a Strengthen with a General Principle question will provide additional justification for the argument’s normative stance. Before you turn to the answer choices, you should articulate to yourself what that stance is: that entails identifying both the conclusion and the reasons offered in support of it. The arguments associated with these questions typically contain a lot of background information that you’ll need to sort out. Restating the argument to yourself in the form of “X because Y” will help you zero in on those portions of the argument that directly support the conclusion. Once you can do so, you’re ready to move on to the answer choices. Step 4: Read every word of every answer choice. Your approach to the answer choices will be virtually identical to the approach you use on Principle questions, discussed in Case 3. Two aspects of that approach bear special emphasis here. First, the key to success is parsing and matching. Break each answer choice down into its component parts. Typically there will be two parts to the principle: a rule to govern decisions or behavior, and a condition or context that triggers the rule. After you’ve broken the principle down into parts, see if you can match each part of the principle to a corresponding part of the argument. This bite-sized, back-and-forth approach builds in analytical precision. The right answer will match 100 percent; wrong answers will have one or more mismatched components. Second, the right answers to Strengthen with a General Principle questions vary tremendously in their level of generality. Some of them are very concrete, utilizing the same terms as the argument. Others speak at a very high level of abstraction, pronouncing general ethical and decisional principles that would make a philosophy professor proud. Oil-rig operator: The government should not fine me for negligently operating the rig, even though it is possible I could have prevented the drill pipe from rupturing if I had been monitoring the pressure gauge more carefully. At the time the pipe ruptured, I was operating the rig in compliance with all relevant federal regulations. If the hydraulic-release valve had been correctly installed on the rig, pressure would not have built up inside the drill pipe, and the pipe would not have ruptured. Which one of the following principles, if valid, provides the most support for the operator’s argument? (A) When the drill pipe on an oil rig ruptures, the government should not fine the rig operator if the sole, exclusive cause of the rupture was the incorrect installation of a hydraulic-release valve. (B) The government should fine oil-rig operators after accidents only when an operator should have anticipated the accident. (C) The government should fine an oil-rig operator whenever the operator’s failure to comply with relevant federal regulations causes a drill pipe to rupture. (D) When the drill pipe on an oil rig ruptures, the government should not fine the rig operator if the cause of the rupture was anything other than the operator’s failure to comply with a relevant federal regulation. (E) When a drill pipe on an oil rig ruptures, the party whose negligence most proximately causes the rupture must bear all cleanup costs associated with the rupture. Answer and Analysis. The term should not in the opening sentence of the argument indicates that the first clause of this sentence is the argument’s conclusion. Using the “X because Y” technique, this argument contends that the government should not fine the oil-rig operator because he or she was operating the rig in compliance with all relevant federal regulations at the time the drill pipe ruptured. The rest of the argument functions as background information. That means you’re looking for an answer that (1) announces the same rule of decision (no fine after a drill-pipe rupture); (2) for the same reason (regulatory compliance). The correct answer is thus choice D. Note the low level of generality of this answer choice: it’s less a general principle and more a restatement of various parts of the argument. This isn’t uncommon on Strengthen with a General Principle questions. Choice A is a match on rule of decision, but it gets the reason wrong. According to the argument, the operator might have been able to prevent the rupture by more closely monitoring the gauge, so the faulty valve was not the sole, exclusive cause of the rupture. Choices B and C both misstate the rule of decision (each proposes a scenario when a fine is appropriate; you’re looking to justify a decision not to impose a fine). Both are also a mismatch on the reason: there’s nothing in the argument about reasonable anticipation, and the argument expressly belies the claim that the operator failed to comply with the relevant federal regulations. Finally, choice E is simply off topic: the argument is concerned with whether the government should fine the operator, not the broader question of who will be responsible for cleanup costs. This case explains the best approach for answering Arguments questions that ask you to resolve an apparent paradox. Paradox questions have made up only 7 percent of the questions over the past few years, which is an average of three or four questions per LSAT. Paradox arguments are made up of two statements. There will appear to be some kind of tension, inconsistency, discrepancy, or conflict between them. Each of the answer choices will introduce some new information that pertains to the topic of the two statements. The correct answer will help dissolve or explain away the apparent inconsistency between the argument’s two statements. Paradox questions are most similar to Assumption and Strengthen questions. Each asks you to identify a piece of new information that can be added to the argument so that all of the argument’s parts fit together in a logically coherent way. resolve the apparent paradox described above? contribute to an explanation of the apparent discrepancy between the results of the two studies? explain the conflict between [part one of the argument] and [part two]? account for the findings of the study described in the argument? On each of the previous question types we’ve discussed, your focus has been on identifying the argument’s conclusion and premises. But a Paradox question has neither. It has a pair of observations (sometimes accompanied by a sentence of background information to help orient you to the conflict presented). Accordingly, as you read, your focus should be on identifying the two conflicting statements. The conflict itself usually appears near the end of the argument. Cuisine from the south of Italy is one of the most popular kinds of food in the United States. But this is not the case for northern Italian cuisine. In fact, in a recent survey, northern Italian cuisine was voted one of the least popular styles of cooking in the country. The use of but as a transition indicator helps you to locate the conflicting or contradictory statements in the argument. You have two seemingly similar types of food—one of them is popular while the other is not. 1. Why would statement 1 be true while statement 2 is also true? 2. Why would statement 1 be true if statement 2 is not also true? You’re looking for the answer choice that provides the best answer to the question you asked yourself at step 3. The correct answer to a Paradox question will address both sides of the conflict and explain away the difference between them. 1. Offers a generic background statement. This is the most common type of wrong answer on Paradox questions—all fluff and no substance. These answers read like something you might say in response to a professor’s question when you haven’t done the reading for class. 2. Makes the conflict worse. This second most common type of wrong answer exacerbates the conflict instead of helping to dispel it. On test day, when you’re working under time pressure, selecting a choice that addresses both sides of the paradox without reading it carefully is an easy mistake to make. 3. Has the same effect on both sides of the conflict. Another common varietal of wrong answer is a choice that introduces a factor or consideration that applies to both sides of the conflict with equal force or in the same manner. A Paradox question presents two statements that are diverging where you wouldn’t expect them to. The correct answer will affect the two sides of the conflict differently. 4. Makes an irrelevant comparison. This common type of answer choice introduces a third statement or category of information over and above the two in the argument. 5. Draws a distinction within one side. Answer choices like these ignores half of the question. Subdividing one half of a paradox into smaller parts and distinguishing among those parts doesn’t shed light on the reasons for the discrepancy between the two halves of the conflict. Which one of the following, if true, most helps to resolve the apparent paradox described above? (A) The variety, quality, and affordability of international cuisine available in the United States have skyrocketed in recent years. (B) Northern Italian cuisine frequently incorporates obscure ingredients that are difficult to locate, while the ingredients necessary to prepare southern Italian cuisine are easily found in most American grocery stores. (C) Southern Italian cuisine is more time-consuming and labor-intensive to prepare than northern Italian cuisine is. (D) Immigrants from all parts of Italy brought their local cuisines with them when they came to the United States in great numbers in the nineteenth and twentieth centuries. (E) Southern Italian cuisine has recently become more popular in the United States than French cuisine, which for many years was this country’s favorite international food. Why would southern Italian cuisine be so popular while northern Italian cuisine is so unpopular? Because northern Italian cuisine frequently incorporates obscure ingredients that are difficult to locate, while the ingredients necessary to prepare southern Italian cuisine are easily found in most American grocery stores. We can see why southern Italian cuisine is popular (it incorporates ingredients that are easy to find), and we know why its northern counterpart is less so (the necessary ingredients are more difficult to locate). This technique will also help you confirm that the choice you’ve selected addresses both halves of the paradox. Choice A is a generic background statement that is loosely connected to the topic of the argument but engages in generalization or pontification. Choice C addresses both sides of the question you formulated in step 3, but it tells you that the southern cuisine is more troublesome and yet it is more popular, making the argument even more of a paradox. In choice D, knowing that Italian immigrants from all regions of Italy brought their native cuisines with them to the United States does not provide an explanation for why two subtypes of Italian cuisine have fared so differently. It therefore has the same effect on both sides of the conflict, and is the wrong choice. Choice E makes an irrelevant comparison. The right answer needs to reconcile the popularity of two different kinds of Italian cuisine. Learning about French cuisine doesn’t aid that effort. We’ll conclude this case by describing a trend that’s emerged among Paradox questions on recent tests. The single most frequent way a correct answer resolves an apparent paradox is by discrediting a study, survey, interview, poll, or piece of research. Mayor: Last week my staff took to the streets of downtown and polled thousands of pedestrians about their views on the city’s proposed bond package. More than 55 percent of the people we polled said they planned to vote in favor of having the city issue bonds. Yet the bond proposal was defeated on Election Day. Which one of the following, if true, most helps to account for the discrepancy between the poll results and the defeat of the bond proposal? This case introduces the strategy for working Arguments questions that ask you to pick an answer choice that weakens the conclusion of the argument. Weaken questions typically account for about 9 percent of the questions on the Arguments section, an average of four or five per test. Weaken questions are the fourth variety of question that asks you to find something that’s missing from the argument. Whereas the question types just covered asked you to be the argument’s ally, Weaken questions make you the argument’s enemy. Your orientation shifts from aiding the argument to undermining it. Weaken questions follow a predictable pattern similar to the one described in Case 5. The argument associated with a Weaken question invariably starts out with premises that present specific facts, data, information, or evidence. The conclusion then formulates a theory, explanation, prediction, or solution based on that data. The correct answer to a Weaken question will somehow show that the data do not support the conclusion. most seriously weakens [the speaker’s] argument? most calls into question the claim above? most strongly counters [the speaker’s] claim? most seriously calls into question the evidence offered in support of the conclusion above? You will approach a Weaken question in virtually the same way as a Strengthen question. Your first priority is to identify the conclusion and the premises used to support it. Case 1 introduced the idea that conclusions are statements of opinion, while premises are statements of fact. A version of that idea holds true on Weaken questions. The opinion expressed by the conclusion to such a question will be a theory, explanation, prediction, or solution. Accordingly, the conclusion will use words that express probability, likelihood, or normativity. Examples include probable, improbable, likely, unlikely, should, ought to, need to, never, rarely, always, frequently, will, would, and cause. Political consultant: Most of the candidates in the upcoming election believe that the economy is the single most important issue to voters. However, in the latest poll conducted by my firm, a majority of voters did not select “strong record on job creation” as the quality they thought was most important in a candidate. This is evidence that the candidates are overestimating the likelihood that most voters will base their voting decision on economic issues. Here, a conclusion indicator (“This is evidence that …”) introduces the last sentence. That sentence also uses the term likelihood, which is typical of the kinds of opinions that the conclusions of arguments associated with Weaken questions will express. The argument’s first sentence provides background information, and the second sentence contains the data or evidence on which the argument’s conclusion is based. Weaken questions are all about the relationship between a specific fact or piece of data and a conclusion that, while based on that data, speaks in broader, more general terms. The answer choices will test the relationship between the data and the conclusion. There are two techniques you may be able to use to help you home in on that relationship. 1. What theory, explanation, prediction, or solution does the conclusion advance? 2. What evidence or data do the premises offer in support of that conclusion? 3. How do the data support the conclusion? The correct answer to a Weaken question will cast doubt on the relationship between the premises and the conclusion. Articulating the precise nature of that relationship will make it easier to spot the correct answer. Continuing with this example, the conclusion’s theory is that candidates are overestimating the importance of economic issues to voters. The evidence offered in support of that theory is that most voters surveyed did not list job creation as an issue that was important to them. That data support the conclusion because job creation is an example of an economic issue. Not every Weaken question has a language gap like this, but many do. When you see one, take note; it’s likely the key to finding the correct answer. Whereas on Assumption questions you would have been looking for an answer that bridged the language gap between these two terms, on a Weaken question you should be on the lookout for an answer choice that points out this gap or somehow emphasizes its significance. 1. Undermine the connection between the data and the conclusion. This is by far the most common type of right answer to a Weaken question: an answer choice that undermines the connection between the data in the premises and the theory in the conclusion. Such an answer choice typically provides new details or information that reveals a flaw or shortcoming in the data. Put differently, the answer choice will make explicit an assumption built into the data and demonstrate that the assumption is faulty. 2. Introduce new data that are inconsistent with the conclusion. Another common type of right answer on Weaken questions is one that introduces new facts, data, evidence, or information that is inconsistent with the conclusion. Whereas the previous type of right answer would provide additional details about the evidence contained in the premises, this type of answer will introduce entirely new evidence, facts, and information wholly outside the scope of the premises. Where the argument is one, such as this example, that has a language gap between the premises and the conclusion, the correct answer will frequently introduce new data that highlight that gap. 1. Strengthens the argument. You’ll find this type of wrong answer on almost every Weaken question you encounter. These choices can be tempting because so many of the questions on the Arguments section ask you to select an answer choice that bolsters, or is at least consistent with, the information in the argument. 2. Weakens a straw man. A straw man is a misrepresentation or a mischaracterization of an argument. Many wrong answers to Weaken questions employ this argumentative tactic, undermining a conclusion that, upon close inspection, is not the conclusion advocated by the argument. Straw-man answer choices usually misrepresent the argument’s conclusion by restating it in more extreme, categorical, black-and-white terms. 3. Offers a generic background statement. This type of wrong answer should look familiar to you by now; it also shows up on Assumption, Strengthen, and Weaken questions. The choice might provide additional information about the topic of the argument or clarify a premise. A choice like this illustrates why it’s important to answer the three questions listed in step 3 before you turn to the answer choices. 4. Invites you to make an inference. This final category of wrong answer choice can be a vexing one. A correct answer to a Weaken question will directly undermine the soundness of the argument’s conclusion without requiring you to import any outside knowledge or information. If you find yourself going beyond the information on the page to postulate ways that the choice might weaken the argument, you’re likely in the process of talking yourself into an incorrect answer. (A) The voters polled by the consultant’s firm were a representative sample of all voters likely to participate in the upcoming election. (B) The polling conducted by the consultant’s firm did not establish that there is no likelihood that any voter will base his or her voting decision on economic issues. (C) The consultant’s firm conducted its polling of voters using methods developed in the quantitative political-science literature. (D) Polls whose questions are followed by a list of answers from which the poll respondents must choose have been shown to produce markedly different results from polls that allow respondents to generate their own answers to the poll questions. Answers and Analysis. The correct answer is choice E, as it undermines the connection between the data in the premises and the theory in the conclusion. Choice A strengthens the argument, which is the opposite of what the question asks you to do. A wrong answer choice like this will certainly trip up the test taker who did not read the question carefully. Choice B weakens a straw man. The consultant does not claim to have proven that there will not be a single voter who bases his or her vote on economic issues. Rather, the conclusion says the likelihood that a majority of voters will do so is low. Choice C cannot be the correct answer; it says nothing about whether voters are concerned with economic issues. Finally, it can be easy to talk yourself into a choice such as choice D by speculating about the consequences of the information it contains: “Oh yeah, that could weaken the argument. If a different kind of poll might have produced a different result, then maybe this poll wasn’t accurate and if they’d used the other method it would have shown that job creation is a high priority for voters.” That kind of thinking is a red flag. This case discusses questions in the Arguments section that ask you to describe the argument’s reasoning. In the recent past, Describe questions represented a little more than 9 percent of all the questions in the Arguments section, for an average of about four or five per test. Describe questions are the first of three question types that require you to understand and analyze the method, pattern, and structure of the reasoning employed by the argument. In one sense, Describe questions are a change of pace from Strengthen, Weaken, and Paradox questions. Describe questions pertain entirely to what’s already written on the page; you won’t have to look for gaps or figure out what’s missing. Even so, Describe questions build heavily on the skills you’ve developed while working the previous cases. The ability to identify an argument’s conclusion, premises, and background statements is the backbone of a sound approach to Describe questions. The common thread between these questions is the importance of identifying the different parts of an argument and describing how they fit together. The most common type of Describe question asks you to explain what role a particular statement plays in the argument, so this case focuses on such questions and concludes with a brief discussion of the other two types of Describe questions. Below are the most common phrasings of questions that focus your attention on defining the role a particular statement plays in an argument (where you see an ellipsis, the question would reproduce verbatim the relevant portion of the argument). Which one of the following most accurately describes the role played in the argument by the statement that […]? The observation that […] plays which one of the following roles in the argument? The claim that […] figures in the argument in which one of the following ways? The question tasks you with determining the role played by a particular statement in the argument. The first thing you should do when reading the argument is to circle the statement in the argument that you’re concerned with. 1. An intermediate or subsidiary conclusion. Consider this simple argument: “All men are mortal. Socrates is a man. Therefore, Socrates is mortal. No one who is mortal lives forever. Therefore, Socrates will not live forever.” In this argument, the statement “Socrates is mortal” is an intermediate or subsidiary conclusion. It is a conclusion because it is supported by the first two premises of the argument. But it is subsidiary because it, in turn, supports the argument’s main or ultimate conclusion that Socrates will not live forever. Identifying that a particular statement is an intermediate conclusion is the most common classification that a Role of the Statement question will ask you to make. 2. The statement to be refuted. “Some people contend that Socrates is immortal. This is false. Socrates is a man, and all men are mortal. Therefore, Socrates is mortal.” In this example, the argument’s ultimate conclusion is that Socrates is mortal. What role does the first sentence of the argument play vis-à-vis that conclusion? It is the claim the argument sets out to disprove. The statement is not the argument’s conclusion; indeed, it states the opposite of the conclusion. Nor is it a premise, because it doesn’t lend any support to the conclusion. Even so, it plays an important role in the argument by framing the discussion as one that criticizes a particular idea or viewpoint. Identifying a statement as one that the argument sets out to disprove is the second most common classification that Role of the Statement questions ask you to make. 3. The difference between an analogy and evidence. Being the basis for an analogy is a different role for a statement than being a piece of evidence. Evidence is a fact that directly supports a conclusion. An analogy is a comparison of one situation to another similar situation. For example, “Teachers should make use of visual aids in the classroom. Doing so would help students retain the material they were being taught, just as sales presentations that use visual aids are more effective at winning customers.” The statement about sales presentations is not direct evidence for the conclusion about teaching, but as an analogy it offers an indirect reason to accept the argument’s conclusion. Once you’ve read the argument, take a moment to attach a label to the statement that’s the subject of the question. You should be able to articulate to yourself what role the statement plays before you turn to the answer choices. Be precise. For example, if an argument has both an intermediary conclusion and an ultimate conclusion and the statement at issue is a premise, make sure you know which of the two conclusions that premise supports. The right answer will correctly describe the role the statement plays in the argument. There are no telltale signs of right answers or categories of wrong answers here. You’ll see the same few descriptive terms repeated across these questions: ultimate conclusion, intermediate conclusion, premise, the statement to be refuted; an example that illustrates the conclusion; evidence in support of the conclusion; an analogy that strengthens the conclusion; a response to an objection; and so on. Whether one of those labels is right or wrong depends entirely on the context of the question. Athletic trainer: A severe case of plantar fasciitis is unlikely to be ameliorated by a traditional program of physical therapy, since plantar fasciitis is an inflammation of the ligaments that run along the bottom of the foot. Because traditional physical-therapy programs feature stretching and exercise, which cause blood flow to the muscles and connective tissue in the patient’s feet to increase, such programs result in inflammation of the ligaments along the bottom of the foot. Which one of the following most accurately describes the role played in the argument by the athletic trainer’s statement that traditional physical-therapy programs feature stretching and exercise? (A) It is a premise that directly supports the argument’s main conclusion. (B) It is the argument’s intermediary conclusion. (C) It expresses a viewpoint with which the argument expresses disagreement. (D) It is a premise that supports the argument’s intermediate conclusion. (E) It is the argument’s ultimate conclusion. Athletic trainer: (1) Traditional physical-therapy programs feature stretching and exercise. (2) Stretching and exercise cause blood flow to the muscles and connective tissue in the patient’s feet to increase. (3) Therefore, traditional physical-therapy programs cause inflammation of the ligaments along the bottom of the foot. (4) Plantar fasciitis is an inflammation of the ligaments that run along the bottom of the foot. (5) Therefore, a severe case of plantar fasciitis is unlikely to be ameliorated by a traditional program of physical therapy. As the rewrite illustrates, this argument has both an intermediate conclusion (sentence 3) and an ultimate conclusion (sentence 5). Since the argument asks you what role statement 1 plays, you can eliminate choices B and E. Statement 1 is a premise; it helps the argument build toward its conclusions. Since it is a simple, descriptive statement of fact that expresses no viewpoint, you can also eliminate choice C. As a premise, it directly supports the intermediate conclusion. Sentences 1 and 2 enable the argument to draw the conclusion stated in sentence 3, which then combines with sentence 4 to directly support the ultimate conclusion in sentence 5. Therefore, the correct answer to this question is choice D.
One final note: suppose the question instead had asked what role was played in the argument by the claim or notion that “a traditional program of physical therapy can ameliorate a severe case of plantar fasciitis.” That statement would fall within the “foil of the argument” classification—the claim or viewpoint to be refuted. As previously noted, there are two additional varieties of Describe questions. One will ask you to identify the point of disagreement in an argument between two speakers; the other will ask you to describe how the argument proceeds. Your basic approach to reading these arguments is the same as it is to a “Role of the Statement” question. You should read each speaker’s argument and identify its conclusion and premises. Typically, the speakers disagree by reaching a different conclusion on a particular topic. Sometimes, however, they agree on the conclusion but disagree over the reason that conclusion is true. The answer choices to these questions will be concrete and tied to the subject matter of the argument. Clarence: All students should take art classes, as they derive many benefits from doing so. Students find painting, drawing, and other forms of artistic expression to be relaxing, and these artistic forms foster creativity and an appreciation for aesthetics. Plus, students who study art have been shown to be less impulsive and more empathetic. Art classes promote healthy, well-rounded development. Ruth: My objection to students’ taking art classes is that such classes reduce the total instruction time spent on math and science. These subjects help prepare students for the modern workforce. Art classes do not. Answer and Analysis. The correct answer is choice B. The conclusion of Clarence’s argument is the first half of its first sentence: “All students should take art classes.” The rest of his argument offers six or seven premises in support of that conclusion. Ruth, on the other hand, has an “objection to students taking art classes.” That’s the basic point about which they disagree. Clarence thinks all students should take art classes, while Ruth thinks they should not. Choice B encapsulates this dispute. Choice A is incorrect because it introduces an irrelevant comparison. Ruth does not object to Clarence’s proposal because she thinks there are better ways to promote healthy, well-rounded development; she is focused on a different issue entirely (namely, preparing students to join the modern workforce). Choice C is incorrect because it is not tied to the subject matter of the argument; it introduces a new topic (music classes) that was not discussed by either speaker. Choice D is incorrect because Ruth does not take issue with the truth of Clarence’s premises; instead, she argues that he is focusing on the wrong considerations. Choice E is wrong for a similar reason; Clarence does not attempt to defend art classes on the ground that they prepare students to join the workforce. Again, you should start out by identifying the argument’s premises and conclusion. But you should also go one step further. Once you’ve labeled each part of the argument, attach a sublabel to it. Is the conclusion a prediction, an opinion, a solution, a theory, a principle, or a policy judgment? Are the premises anecdotes, observations, examples, data, or the results of a study? As you work through the answer choices to these questions, make use of the parse-and-match method you learned in Case 3. Each choice will have several different components. Take one part of the choice and see if it corresponds to one part of the argument. If it does, repeat the process with the next part of the description; if it doesn’t, move on to the next answer choice. The correct answer will accurately describe the argument’s reasoning without any omissions or additions. Doctor: It is highly likely that my patient is suffering from either mononucleosis or a penicillin-resistant bacterial infection. Blood work confirms that the patient is not suffering from a penicillin-resistant bacterial infection. As a result, I am virtually certain that my patient has contracted mononucleosis. Answer and Analysis. The correct answer is choice D. The doctor’s conclusion appears in the last sentence of the argument: she is virtually certain that the patient has contracted mononucleosis. She draws this conclusion based on two premises: (1) it is highly like that her patient has either mono or a bacterial infection, and (2) blood work has ruled out the possibility of a bacterial infection. Thus, the premises present two possible diagnoses and then rule out one of them. The conclusion endorses the correctness of the other diagnosis. Each part of choice D corresponds to one portion of the argument. The parse-and-match method eliminates each of the remaining answer choices. Choice A is incorrect because the argument does not discuss an ongoing epidemiological trend. Choice B is incorrect because the argument does not refute a claim. The doctor is advancing her own theory about the patient’s diagnosis, not rebutting a theory offered by someone else. Choice C is incorrect because the doctor does not discuss the particular symptoms that led her to her diagnosis. And choice E gets the argument’s structure backwards: from the premise that one of two possible diagnoses must be incorrect, the argument concludes that the other diagnosis must be correct. This case addresses Arguments questions that ask you to criticize or find a flaw in the reasoning of an argument. Flaw questions have been the second most common question type on recent LSATs, accounting for about 16 percent of the test (an average of eight questions). Flaw questions are like Describe questions with an editorial bent. The arguments associated with Flaw questions typically commit one of a handful of common errors of reasoning. Once again you’ll start out by breaking the argument down into parts and understanding what role each part plays. You’ll then go one step further and find the “flaw” in the argument. This case will introduce you to those errors of reasoning and teach you how to identify them. Which one of the following most accurately describes a reasoning flaw in the argument above? Which one of the following most accurately describes the error in [the speaker]’s reasoning? You should take the same approach to reading the argument associated with a Flaw question that you take on Describe questions. Start out by breaking the argument down into background information, premises, and conclusions. Pay attention to the relationship between the premises and the conclusion. Does the argument offer a theory to explain some data? A prediction based on a survey or a poll? An opinion based on experience? Many Flaw questions use arguments that attempt to undermine or discredit an opposing viewpoint. These arguments go something like, “Some people say X. But they’re wrong for Y reason.” In the previous case, you learned how to identify when part of an argument is playing the role of the statement to be refuted. If you see such a statement on a Flaw question, pay close to attention to how the argument attempts to discredit it. Necessary Versus Sufficient Conditions. Sometimes a particular outcome depends in some way on a condition. A condition can be either necessary or sufficient. A necessary condition is a deal-breaker. The absence of a necessary condition forecloses the outcome from being obtained. For example, being a fruit is a necessary condition of being an apple. A sufficient condition is a deal-maker. Satisfying a necessary condition isn’t always enough to guarantee that an outcome will be obtained, and sometimes an outcome can be obtained even if a sufficient condition is not satisfied. For example, being an apple is a sufficient condition for being a fruit. Confusing Parts and Wholes. When a whole is composed of multiple parts, it frequently takes on qualities that are not shared by any of its parts standing alone. For example, if a paragraph is very long, it does not follow that each of the sentences in that paragraph is also very long. The paragraph could be composed of numerous short sentences. Conversely, each individual component of a bicycle might be able to fit in the trunk of your car, but it does not follow that the bicycle itself will also fit in the trunk. Tourist: I’ve seen three people walking down the street today drinking Red Bull. Red Bull must be very popular in New York. The fact that three people have been seen drinking a particular beverage is not an adequate basis on which to conclude that the beverage is very popular in a city with millions of residents. Paleontologist: My research into the fossil record reveals a high concentration of volcanic ash in the atmosphere during periods with high rates of species extinction. Therefore, volcanoes cause mass extinction. The mere fact of correlation (the fossil record and volcanic ash), without any additional facts or evidence, is not enough to support an inference of causation. Market analyst: The Nikkei Index dropped by more than 7 percent today, while the Hong Kong Stock Exchange was down nearly 5 percent. Clearly the market in Hong Kong was responding to the slow trading in Tokyo. This argument overlooks the possibility that the drop in both markets was caused by some third factor—such as a dip on the New York Stock Exchange, increased oil prices, a natural disaster, the release of poor earnings reports, or any number of other reasons. Similarly, an argument might erroneously assume that A causes B when in actuality B causes A (“Whenever it rains, people carry umbrellas. Therefore, carrying an umbrella makes it more likely to rain”). Boy: I deposited my money in a bank. There are two banks along every river. Therefore, I probably deposited my money somewhere along a river. This is a silly and obvious example. It’s far more common for a shift in meaning to be more subtle. Researcher: My colleague suggests that the results of my study are not reliable because I used a faulty research method. But she herself used the same method in her last study. This kind of argument inappropriately criticizes the speaker instead of what is spoken. It is foolish to suggest that handgun ownership should be banned. How could people feel safe in their homes without any firearms to defend themselves against intruders? Suggesting that a total ban on all forms of firearms (handguns, shotguns, rifles, etc.) would make people feel unsafe is not responsive to the more limited proposal to ban handguns. Patient: Dr. Hernandez is an excellent doctor. She has the longest waiting list of any doctor in the city. Popularity is not evidence of reliability or accuracy. 1. Inapplicable flaws. You can expect to see more than one of the common fallacies and errors of reasoning listed above as answer choices for each Arguments question. Only one flaw can be the right answer. When you’re picking between flaws, you should be able to pinpoint where the flaw occurs using the work you did in steps 2 and 3. 2. Circular reasoning. An argument engages in circular reasoning when it assumes the truth of the point that it sets out to prove. For example: “Jane and Lila played a game of tennis. Jane lost. Therefore, Lila won.” This argument is circular. By stating “Jane lost” as a premise, the argument takes it for granted that Lila won. The odds of your seeing a Flaw question in which the argument displays circular reasoning are less than 5 percent. But “the argument engages in circular reasoning,” “the argument assumes the truth of what it sets out to prove,” and “the argument begs the question” are some of the most common wrong answer choices on Flaw questions. When you see circular reasoning as one of the answer choices, you should indulge a superstrong presumption against picking that choice. 3. A feature of the argument that is not a flaw. For example, an answer choice might accuse an argument of “rejecting a view merely on the ground that an inadequate argument has been made in support of it.” That might be an accurate description of the argument, but that’s not a flaw! Rejecting a view because it has been inadequately supported is the essence of logical reasoning. This type of answer choice can be very tempting because it is an accurate description of the argument. Don’t select a choice unless you agree that the pattern of reasoning it describes is questionable, unreliable, or faulty. Pet-store owner: When you purchase a coral trout, you can be assured that you are purchasing one of the most beautiful fish in the world. The wide array of fish, sea snakes, turtles, and mollusks that inhabit the waters around the Great Barrier Reef make up the world’s most beautiful collection of marine fauna. And the coral trout’s natural habitat is the waters around the Greater Barrier Reef. Answer and Analysis. The correct answer to this question is choice E. The conclusion of this argument is its first sentence: the coral trout is one of the most beautiful fish in the world. But the only evidence for that conclusion is that the coral trout can be found in the Great Barrier Reef. The beauty of the Great Barrier Reef’s sea life, as a group, does not guarantee that every species that lives near the reef is also, individually, beautiful. Choice A is incorrect because the argument does not assert the existence of any causal relationship. Choice B is incorrect because the argument does not rest on a sample (i.e., the problem with the argument is not that most coral trout are dissimilar to the coral trout discussed by the pet-store owner). Choice C is incorrect because there is no indication in the argument that the term beautiful has shifted in meaning. And choice D is incorrect because the argument does not turn on the precise meaning of the term habitat; the focus of the argument is the beauty of the fish. It can be hard to generalize about the level of difficulty of most of the question types you’ll encounter in the Arguments section. The exception to that rule is a question that asks you to identify the answer choice that most closely parallels the argument’s reasoning. None of these questions is easy. Many of them are among the hardest questions you’ll encounter in the Arguments section. All of them are inordinately time-consuming. Fortunately, over the past few years they’ve made up a little less than 8 percent of the questions in the Arguments sections. The reasoning in which one of the following is most similar to the reasoning in the argument above? The pattern of reasoning in which one of the following is most similar to that in the argument above? The flawed pattern of reasoning in which one of the following is most closely parallel to that in the argument above? Which one of the following arguments exhibits a pattern of flawed reasoning most similar to that in the argument above? The questionable reasoning in the argument above is most similar in its reasoning to which one of the following? These latter questions tell you that the argument is flawed, questionable, or unsound; the former questions imply that the argument is valid. That distinction doesn’t make a difference to how you should approach these questions, but it can sometimes help you ensure you’re on track to finding the right answer. When you read the argument associated with a Parallel question, your focus should be not on its substantive content but rather on the structure of the reasoning it employs. Most arguments are nothing more than a series of conditional statements. 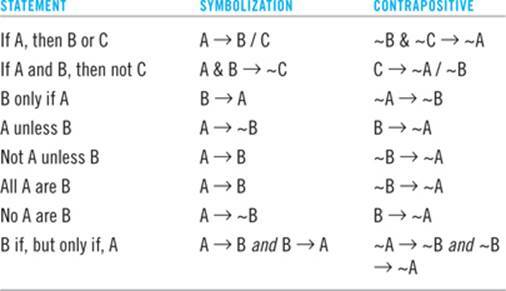 You should use symbolizations to map out the reasoning employed by such arguments. Parallel questions do not require you to substantively manipulate conditional statements or make deductions based on them. Instead, they require you to keep track of the ways in which the argument and the five answer choices use conditional statements. Rare indeed is the Parallel question whose argument employs nothing but standard-form “If A, then B” conditional statements. Even beyond these complicated but familiar translations, Parallel questions will test your ability to recognize when a natural-language statement can be translated into a conditional symbolization. For example, a sentence that begins “every” or “any” is usually an “All A are B” conditional statement. The correct answer to a Parallel question will utilize a pattern, structure, method, or strategy of reasoning that is identical to the one employed by the argument. So before you turn to the answer choices, you should use your symbolization tools to map out the pattern of reasoning the argument employs. Strategist: Politicians who are not firmly committed to a core set of beliefs will formulate new campaign strategies and talking points before each upcoming election. Politicians are elected to serve multiple terms in office only if they formulate new campaign strategies and talking points before each upcoming election. Therefore, politicians who are not firmly committed to a core set of beliefs are elected to serve multiple terms in office. Which one of the following displays a flawed pattern of reasoning most closely parallel to that in the strategist’s argument? It may not be obvious at first, but every statement in that argument is—or at least can be made into—a conditional statement. Before you turned to the answer choices on this question, you would need to symbolize the entire argument in conditional-statement form. You can do so at the bottom of the test-booklet page. Remember the rule from the Logic Games chapter and this chapter’s discussion of Deduction questions that the only way to a make a valid deduction using conditional statements is to follow the arrow. This symbolization illustrates why the question tells you that this argument “displays a flawed pattern of reasoning.” It makes an invalid deduction by going against the arrow in its combination of the two conditional-statement premises. That’s how the difference between a question that asks you to parallel the reasoning and a question that asks you to parallel the flawed reasoning can help you double-check that you’re on track to find the right answer. On a Parallel the Flaw question, your symbolization should show that the argument’s conclusion is a deduction that goes against the arrow. On a regular Parallel question, the conclusion should be a valid, arrow-following deduction. You can already begin to see why Parallel questions are so time-consuming; translating each sentence in the argument into a conditional statement and then symbolizing each conditional statement is no easy task. But that’s not even the half of it. To identify the correct answer on a Parallel question, you have to repeat that process for each answer choice until you find a choice that employs the same pattern of reasoning as the argument. The only silver lining within this great cloud is that it’s the one argument type with one answer that is objectively correct. Once you find an answer whose structure matches the argument, pick it and move on. There’s no need to diagram the remaining choices. (A) Music that is pleasing to the ear is melodic. Music that is melodic involves chords and harmony. Thus, music is pleasing to the ear only if it involves chords and harmony. (B) A loyal person is a likeable person, for a loyal person always stands by her friends and a likeable person also always stands by her friends. (C) A well-constructed house includes code-compliant framing, wiring, and insulation. A house is marketable only if it is well constructed. Therefore, a marketable house includes code-compliant framing, wiring, and insulation. (D) Nuclear proliferation will accelerate only if there is widespread access to fissile material. Widespread access to fissile material goes hand in glove with increased regional instability. Therefore, nuclear proliferation will not accelerate unless there is an increase in regional instability. (E) If health-care costs continue to rise, foreign currency markets will devalue the dollar. But health-care costs will not continue to rise. Therefore, foreign currency markets will not devalue the dollar. As these symbolizations illustrate, the correct answer to this question is choice B. One trick the test writers will use to make it more difficult to identify the correct answer is to switch the order in which the statements appear. You see this in choice B, where the conclusion is listed before the two premises, while the argument lists the premises before the conclusion. The order in which statements appear has no bearing on the logical relationship between them, but changing that order can make the passages appear superficially dissimilar. Most of the previous cases discussed the common types of wrong answer choices that are associated with a particular question type. With two exceptions, it’s not possible to undertake such a generalized discussion about Parallel questions because whether an answer is right or wrong depends entirely on the structure of the argument. In short, Parallel questions, like Principle questions, require you to play a matching game. All you can do is symbolize each choice one by one until you find one that matches. As for those two exceptions, here are two generally applicable pieces of advice about wrong answer choices on Parallel questions. First, on questions that ask you to find a parallel pattern of flawed reasoning, one or more of the answer choices will present you with a valid, nonflawed argument. You see that here with choices A, C, and D. Second, it’s also common for two or more answer choices to employ an identical pattern of reasoning. Again, choices A, C, and D illustrate this. You don’t even have to read the argument to know that such choices cannot be correct; if one were right, necessarily the other(s) would be too. This case discusses the strategy you should use to approach the Arguments section as a whole. Section-wide strategy for the Arguments section is less complicated than it is for the Logic Games and Reading Comprehension sections. An effective approach to the Arguments section is one that abides by the following five guidelines. This principle is a constant across all three sections of the test. Rushing your way through the Arguments section in a desperate bid to work every single question is a bad strategy. Your goal is not to answer as many questions as possible. Your goal is to correctly answer as many questions as possible. Again, as discussed in the Logic Games chapter, if you answer 75 percent of the questions (that’s 19 or 20 of the 25 or 26 questions in an Arguments section) at a 90 percent rate of accuracy and then bubble in blind guesses for the remaining 5 questions, you’ll be on track for an excellent score. If your aim is to work 20 Arguments questions in 35 minutes, you have about 1 minute, 45 seconds per question. That’s not a ton of time to read the question, read the argument, work through all five answer choices, and bubble in your selected answer. Accuracy requires you to be careful, precise, and thorough in your approach to the questions. But you also must be efficient and decisive. Time is always a factor. Conclusion questions tend to be among the easiest, most straightforward questions in the Arguments section. You should plan to work every one that you see. Skip all Parallel questions until you’ve already worked every other question in the section. Should you have time left over, come back and try your hand at a Parallel question. Those two exceptions aside, it’s not possible to speak in general terms about the difficulty of each question type. There is tremendous variation within each category. What’s more, you can’t reliably predict how many of each question type will appear in a given Arguments section. 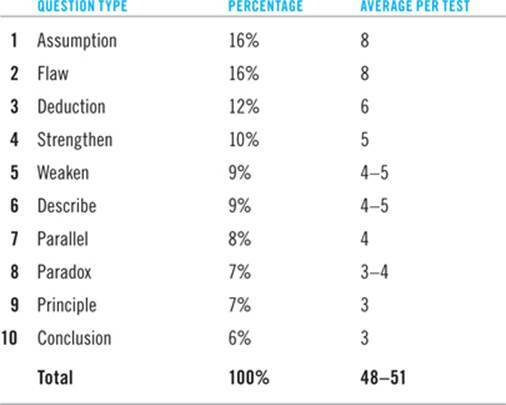 The table at the beginning of this case summarizes the average number of questions of each type that appear on the LSAT as a whole. But there is variation from test to test and from section to section. One recent test had a total of two Strengthen questions (the fourth most common question type); another had seven Principle questions (the second least common question type). You need to be comfortable working all non-Parallel question types. So how do you decide which questions to skip? Skip a question if, after the first time you read the argument, you do not understand what you’ve read. If you’re having a hard time making sense of the content of the argument, your chances of correctly answering the question are very low. Don’t let stubbornness get the best of you here. You don’t have time to read the argument two or three times and then decide that you’re going to skip the question; you need to save that time for questions you’ll actually answer. By all means, put a star in the margin, circle the question number, or make some other note to yourself that you’ve skipped the question. That way, once you’ve worked through all the easier questions, you can come back and give it a second look. But if the first read leaves you scratching your head, move on. This is the exception to the general rule that the questions get harder as the section goes on. The last question in the section is almost always an easy or medium-difficulty question. It’s usually preceded by three or four of the very hardest questions in the section, so if you get bogged down on those, it’s easy to run out of time. Develop a rule for yourself about when you’ll always work the last question in the section. It could be after you’ve worked sequentially up to a particular question number; it could be when you see there are only 10 minutes left in the section. Whatever your rule, stick to it, and make sure you take advantage of this opportunity to pick up an easy point.